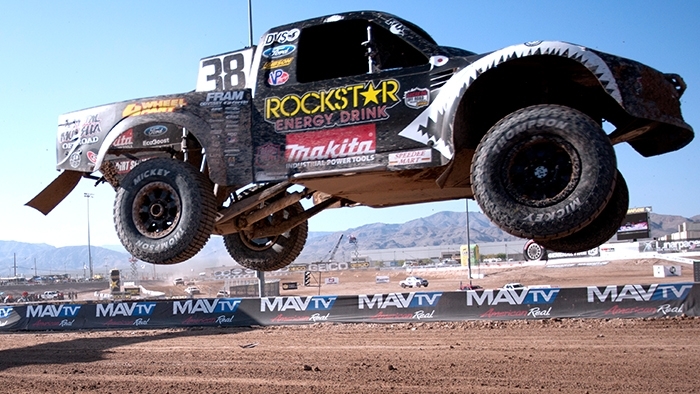 With the championship all but wrapped up coming into the weekend, Brian Deegan took a 51-point lead into the final race of the 2013 championship over Sheldon Creed. After Creed rolled in qualifying, forcing him to start back on the sixth row, things were looking even better for Deegan, who would only need to take the start and not get disqualified in order to lock out his third championship in the category. Deegan got the early lead, and his ultra clean #38 Rockstar/Makita Ford was quickly opening up a lead over the rest of the field. Noah Fouch ran second in the #52 GoPro/BFGoodrich Tires Ford, with RJ Anderson third in the #1 LoanMart/Maxxis Dodge, Kyle Hart fourth in the #41 ReadyLift Off Road Suspension/Southwest Ground Control Dodge, and Bradley Morris fifth in the #24 K&N/Kicker Ford. Over the opening three laps, the top five held their positions, but on lap four, Morris came to a stop just out of turn three, which forced a full course yellow. Racing resumed on lap seven, but a rollover in turn two by Trenton Briley brought that yellow right back out. Briley was able to re-fire and continue, despite heavy damage to his front suspension, but as for the leader, things were suddenly a bit different. As the field slowed to bunch back up behind the pace truck, smoke became evident from the back of Deegan's truck, and with nothing more to gain, Deegan elected to pull into the hot pits and save any further damage to his truck. On the return to green flag racing, it would now be Fouch, Anderson, Hart, Jerett Brooks in the #77 Synergy Electric Racing/Radar Tires Nissan, and Creed in the #74 Traxxas/Method Race Wheels Dodge running in the top five. Hart got by Anderson for second early on the restart lap, but Anderson came right back to strongly challenge Hart over the next two laps. These two, along with the leader Fouch, then ran three-wide over the biggest jump on the track (out of turn two and down into turn three), with Anderson coming out in the lead after the next corner. Brooks managed to pass Hart there, as did Creed, and it was now Anderson, Fouch, Brooks, Creed, and Hart in positions one through five. On the next lap, another trio of drivers went three-wide over the same jump, but this time, things didn't end so smoothly. Creed, Hart, and Fouch were the drivers involved, and Hart got the worst of it. Hart started into a twisting barrel roll in mid-air, and landed nearly on his roof, which sent him sideways and into a violent, fast set of snap rolls. With nothing to slow him, Hart did at least eight full rolls down the slope into turn three, before finally coming to a stop off to the left of the entrance to turn three. Hart was ok, but was nonetheless transported off-site for further evaluations. Our thoughts are with Hart and his family, and we wish him a speedy recovery. After a long red flag/yellow flag period, racing finally resumed, with Anderson, Brooks, Jimmy Fishback, Jacob Person, and Justin Smith running in the top five. Fouch had suffered broken front suspension, and for some reason, Creed was now at the back of the pack. Smith got by Person at turn one on the restart lap to take over fourth, and Casey Currie then got around both Smith and Person on the inside at turn three to move into fourth. Smith picked off Currie for fourth on the next lap, and got Fishback coming out of turn three on lap 17 to move up to a provisional podium finish. On the final lap, Brooks suffered a heartbreaking end to a terrific run, as mechanical issues sent him to the side of the track in turn one. Up front, this left Anderson well clear, and he brought home his sixth win of the season, a nice consolation prize after he missed out on defending his 2012 championship. Smith finished a season-best second in the #19 Competitive Metals/Metal Mulisha Ford, and Fishback equaled his stunning result from back in Round 5, right here at Lake Elsinore, as he rounded out the podium in third in his #48 General Tire/Maximum Turbine Support Nissan. Currie picked up fourth in the #2 General Tire Jeep, and fifth went to Chris Brandt in the #82 BFGoodrich Tires/Simpson Toyota. Despite his DNF this afternoon, Deegan still garnered his third title in five years in the class. Congratulations to Brian Deegan, the 2013 Lucas Oil Off Road Pro Lite Unlimited champion!